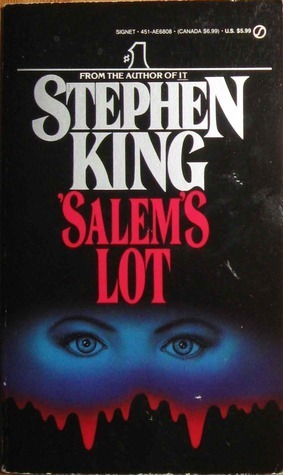 'Salem's Lot is a small town in Maine with more than its fair share of secrets. Ben Mears returns to the town, where he grew up, to write about the creepy Marsten House that scarred him as a child. But the Marsten House has strange new occupants, and before long people in the town start dying from mysterious blood loss. This was my third Stephen King novel, and my least favourite so far. The first thing that bothered me was the writing. Stephen King is an amazing writer. But when he's writing mostly in the voices of uneducated people, his brilliance doesn't really shine through. I'm all for authenticity, but the slang and poor grammar can get tiresome to read. Also, the sheer number of characters made this book one of those ones that I couldn't keep up with. I kept forgetting who people were, because it had been like 30 pages since that person had last spoken. This is a good vampire story. I did really like that part of it. But I found it a bit drawn out. It seemed like I wasn't supposed to know ahead of time that the book was about vampires, so there was slow, spooky build up to that. But, I already knew, because this book is famous. So I kept thinking, have these people really not realised that it's vampires yet? I liked 'Salem's Lot, but I think he does a better job in Needful Things, which echoes the Lot in some ways.